Are you a natural beauty junkie? I met Christine Penny, creator of Angelberry Organics, at a local craft fair. First of all, she is just simply stunning… a natural goddess. We immediately hit it off and vowed to keep in touch. I really dig talking to people who are extremely passionate about their work and serve others with authenticity. As I perused her gorgeous wares (Angelberry Organics is a natural make-up line), she told me stories about her travels, education, and how she found the perfect balance between natural beauty and sustainability. 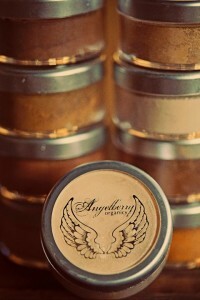 I’m a lucky lady because I recently got to try the Angelberry Organics products. I’ve been looking for a safe, organic make up line for some time now. You want to make sure what you are putting on your body isn’t going to harm you with toxins, but you also want it to have that Cover Girl last all day look. My little gift came in the mail, and as a beauty junkie, I couldn’t wait to try the goodies. The lip gloss has now become my everyday splash of heaven. The gloss is long-lasting (take that Cover Girl! 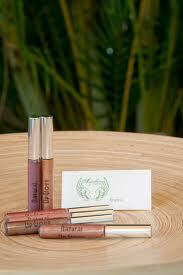 ), shimmers, and keeps my lips looking soft. The best part is that the gloss smells so good. It’s got a clean feeling, and you know that if you accidentally lick your lips, your not eating toxins. Such a relief! I also got to try the mineral powder. Talk about a glow! I used this powder for eyeshadow and for a light dusting on my face, neck, chest and shoulders for that glimmer, willowy look. 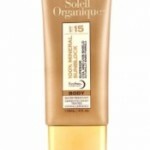 So light and the shimmer lasts all day long. If you haven’t tried Angelberry Organics, I highly recommend that you go for it. The products are beautiful, customer service is out of this world, and you will have peace of mind knowing that the products are better for you, the environment and just plain heaven. As you eat clean, green goodness, how do you make sure you take care of the largest organ, your skin? Make sure to leave me a comment below. Hearing from you makes my day!